Gone are the times when beach fashion was only about a one piece suit covered up with a jersey t-shirt and tattered shorts to match. Fashion has been evolving and the change is evident in various fashion forms. This can be proved with the birth of a new “genre” in fashion-the Resort wear. Promoted by the high end fashion givers for the affluent in the world to meet their taste of glamorous holidays, special collections were created to keep their style quotients soaring even at the beach. Thus, introducing the concept of “resort wear” or “cruise collections”, this in today’s time is one of the most awaited collections by the fashion world every fashion year. Top fashion houses have embraced the concept and create collections as exotic as the locations where these beautiful garments fit. Resort wear is best defined by the bohemian mood. With the most striking prints that leave a lasting impact to the easy dressing silhouettes, resort wear is all about comfort without compromising on an ounce of glamor. An idea established in the bohemian fashion era is reflected in these collections where the ideology is similar for obvious reasons. Resort wear collections not only include the most elaborate and stylized bikinis and swimwear that beautifully balance functionality with glamor but go much beyond that and with the most creative outfits in the form of shorts, kaftans and evening dresses in the most breathable and fuss-free fabrics and in the most vibrant colors from the palette. Needless to say, the trendy and creative cover ups form the highlight of the concept. An integral part of the resort wear category, cover ups are a modest touch to the otherwise bold beach wear and in the most stylish ways. With endless varieties and styles to dig, these stylish fabrics are yet another reason to plan a grand beach vacation. Take a look at the beach cover ups, that fired the runways for the year 2012 and take a hint of the prints and shapes that will be taking over this year. In the past few seasons we all have gone on and on about how in the maxis are and how these make one of the most comfortable pieces of fashion that making it’s way in our wardrobes. So it was expected that the trend also establishes itself when it comes to cover ups. The long length that kisses the heels is dramatic and is a perfect way to make a statement and in sync with the current trend. Fabulous tropical overall printed cover ups accessorized aptly or solid colored ones with plunging neckline and stylishly embellished are perfects ways to glam up the beach look. The wrap style cover ups are not just convenient but ooze feminine chic. Sheer fabrics rule the choice for the cover ups in vibrant colors or bold prints like leopard prints. Some have tie ups to underplay it. These cover ups also make a perfect choice to show off a well toned body and with the stylish bikini peeping out the look is nothing short of eclectic. The bikini can be of the same color as the wrap or a fun contrast. Wear wedges to maintain the comfort resort wear stands for. Tunics make a pretty option for resort wear and are versatile too. Not just can you throw the vibrant tunics over the swimwear as cover ups but can be layered over pants or simply matched with smart belts and worn as dresses. The runways hinted floral prints, bright citrus prints and ethnic tie and dye prints. Opt for solid colors with classic black tunic as a classier option and “the” option if you don’t want to be experimental and yet score high on style. If the word edgy only excites you then try flaunting a tunic that combines the character of two striking prints by combining animal prints with the flirty florals on your cover up. Interesting sleeves shapes always add up wonderfully to the tunic with contrasting hemlines. These probably make the most popular choice as a cover up for the ease and comfort. Kooey swimwear showed a new avatar in their Spring Summer 2012 show by redefining the dress with a slit starting from the bust. Impossibly feminine and flirty. Wrap skirts are an integral part of any resort wear collection. Go bold with the bikini top. The wrap skirts too follow the same trends as most of the other resort wear elements like striking tropical prints, muted black and a color blast with the brights like pink and make for a perfect cover up. Funky cropped tops add to the fun element of the beach wear along with adding to the idea of vacation. An added fun piece of clothing is perfect to add the spark to your beach look as a cover up. Take a cue from the tassels that add a gypsy touch to the otherwise casual dual toned top or a short cropped top, so short which is what catches the eye. Animal prints dominated the runways not in one but various shows. 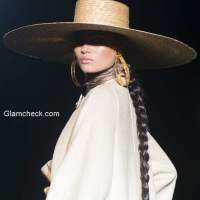 A staple fashion favorite is probably why the trend that takes inspiration from the exotic skins is hard to ignore and was a definite element in most of the shows in the form of most stylish cover ups. It is the interesting riot of colors resort wear promises that draws excitement from the fashion lovers. 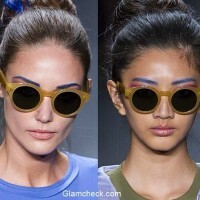 The 2012 runway shows showed cover ups talking the color trends through tangerines, cobalt blue and pastels. The bright fun colors are attractive and are this year forecast as those that will stand out against your tan. Talk boho-glam with these creative cover ups that appeal to you and your style statement. The easy flow of chiffons, silks, breathing cotton and beading detailing tempt many and make for stylish ways to dress yourself with after a splash in the sea and to soak up the sun without compromising on the style.